With a brush, use white paint to draw two large irregular circles around each eye. Line the mouth in the same way using thick irregular paint lines. 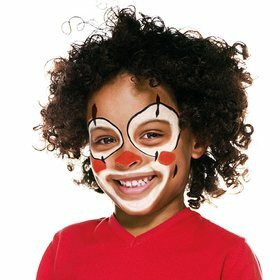 With a brush, use bright red paint to draw a red circle on the nose and each cheek. Using a thin brush and black paint, draw lines around the outside of the eye shapes, with a small line at the tops and bottoms of the circles. 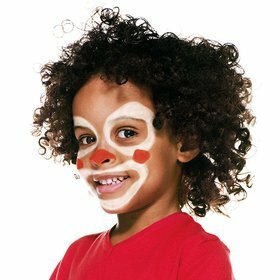 Draw small lines in the cheek dimples to finish your design.